Detects gaps (i.e. void pixels) in raster models and provides several interpolation methods to close them. The generation of Digital Terrain Models (DTM) usually leads to void pixels where buildings and vegetation were removed. Module FillGaps aims to close these gaps with qualified approximation of void pixel using information of valid neighbouring pixels. In a first step, connected void pixels get joined to gap objects with boundary information. Each of the boundary pixels is adjacent to at least one void pixel and contains a valid pixel value. Based on the boundary information the void pixels will be filled with qualified values in a second step. This module uses Module Bounds to detect the area covered with data in the input file. If no specific boundary polygon is given with boundsFile, an alpha shape is calculated covering the area of valid pixels to get the bounds of the dataset. To detect outer boundaries of the dataset (e.g. pixels outside of boundsFile polygon) and avoid filling them with inappropriate values the parameter boundaryRatio is used. The boundaryRatio specifies a minimum ratio between valid boundary pixel of a gap and the total number of boundary pixel including the pixel at the edge of the picture. The boundary ratio describes how well a gap is described by bordering pixels. If a gap has, for example, 15 valid boundary pixel with 20 boundary pixel in total, the boundary ratio is 0.75, which means that the gap is 75% bounded. Only gaps with a boundary ratio greater than or equal to the given threshold boundaryRatio will be processed and filled. 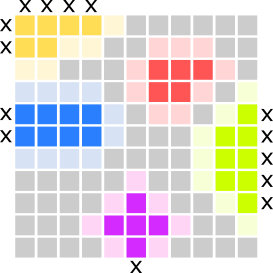 If method adaptive is chosen to fill the gaps, an adaptive plane is fitted for each void pixel. The plane fit is performed based on all valid boundary pixels of a gap, with an adaptive weighting of the pixels based on the distance to the void pixel, where the plane is calculated. The weighting function is based on the inverse squared distance (IDW2) with respect to the dimensions of the gap. This means that a boundary pixel on the opposite side of a gap gets a weight close to zero, while a close-by boundary pixel gets a weight close to one. By using this method, two neighbouring void pixels have similar weights on the boundary pixels in the plane-fit, thus, the method always results in a smooth interpolation within the gap. Please note, that this method is not applicable for big gaps (>100.000 px). As described above, a plane is fitted for each void pixel involving all boundary pixels. Therefore this method is rather slow for big gaps and can lead to abrupt transition between filled pixels and adjacent boundary pixels, because of the influence of distant boundary pixels. The Parameter maxArea allows to specify maximum sizes for gaps to be filled. The first value of the two-value array specifies the maximum area (in unit^2) of gaps to be filled. Especially for the use of the adaptive fill method, where performance issues can be expected for big gaps (as mentioned above), this parameter is of importance. Therefore the second value specifies the maximum area of gaps to be filled with the adaptive fill method. Gaps that are bigger than the specified maximum gap size are filled with the triangulation method. Import raster image in GDAL supported format. Estimation rule: The current directory and the name (body) of the input file are used as file name basis. Additionally, the postfix '_filled' plus the output format specific extension is added. The different fill methods use the boundary points of a gap for the approximation of void pixels inside the gap. Ratio between the number of valid boundary pixel and the total number of boundary pixel of a gap including pixel that lie along the edge of the image or specified bounds. Gaps with a boundary ratio lower than the specified minimum boundary ratio will not be filled. Vector file (supported by opalsImport, e.g. *.shp) containing a polygon which specifies a boundary for the area where the gaps should be filled. The first value of the vector specifies the maximum area of a gap to be filled (in units^2). If the parameter is omitted or set as -1, gaps of any size will be filled (if they are within the bounds). The second value specifies the maximum area to be filled with the adaptive method, if selected (see documentation above). Gaps that are bigger than this maxArea-adaptive threshold are filled with triangulation method, if the adaptive method was selected. If the second value is omitted for use of the adaptive method, the maxArea-adaptive is calculated as 100.000 [px] * px_area [units^2]. The dataset contains a flyover over a highway, which needs to be filled with proper values.